: Cough, cough! What's this smoke!? : I-it smells like medicine! : I-is this some kind of sterilization process!? : Shh. This is the ritual of entry for the sanctum. And that door is the door to Heaven. : Yeesh... I can only pray it's not a door to the real Heaven. : No, no. This is only a place where we can enter. : I was expecting more of a warehouse-like place, since you said it was a payment point. : But it doesn't look like any town I've ever seen. : Still, it's so nice how there's a cultural aroma in the air. : I can tell what you mean, but, uh... how to put it... Isn't it more like an aroma of falsehood? : Why would it be that? This place has everything! : Yeah. It resembles cities from our time. : Actually, it looks almost exactly like the inside of a space colony. : Yeah... Especially in how it seems isolated from the outside world. : Between this and the Ascension of Light... I'm getting the the impression that they're using technology made for space development. : That Ascension of Light could have been in case of an attack by those earlier guys. : Yeah... You might be onto something there. : Okay then, Jiron, Tetsuya and his group, and I will go meet with Biel. : Just look around for a bit. This place is here to teach people like you the wonders of culture. : Don't forget these are the same people who tried to make us and Vickman fight. : Moon Race...? That's the name of the guys using those strange machines? : Yes. To the Innocent... No, to all of those who dwell upon this land... They are enemies. : The Moon Race... These are people who live on the moon? : Yes. They've antagonized those who live on the Earth since long, long ago. : The moon floats up in the sky, how could people live there...? : It may be hard to believe, but it's the truth. : ...I'm sure you have much to ask, but I'd like to ask a question of my own, first. Where on Earth did you Irregulars come from? : ...From Earth, circa SE 187.
: Ess-Ee...? I've never heard of an era named that. : You seem to be well-versed in this Earth's history. Would you mind telling us about it? : Pretty pompous-sounding name, isn't it? : I'd like to make a deal with all of you. : ...Yes. If you accept my request... I'll provide you with all the information, gold, and basic necessities you need at no charge. : Hold on here! None of us other than Elche trust you completely. : Elche, even you should have figured out by now that these guys are the ones pulling Timp and Vickman's strings! : Yeah, they gave new weapons like the Potan Cannon to us and to Vickman, then arranged it so that we'd fight each other. How would you care to explain that? : (.........) I apologize on behalf of my men for the frivolous doubts they've given you. : The truth is, the request I'm about to discuss has to do with my men's actions as well. : Okay, then how's about we hear this request of yours first? : It's simple. I'd like for all of you to join the fight against the Moon Race. : The reason we sent Vickman after all of you... Was to test the new weapons developed for our upcoming fight and to ensure that you built up some real combat experience. : So, was Timp killing my parents something else you guys set up!? : No, it wasn't. Timp is just a liaison for Vickman. : ...Uh-huh. So let me get this straight. 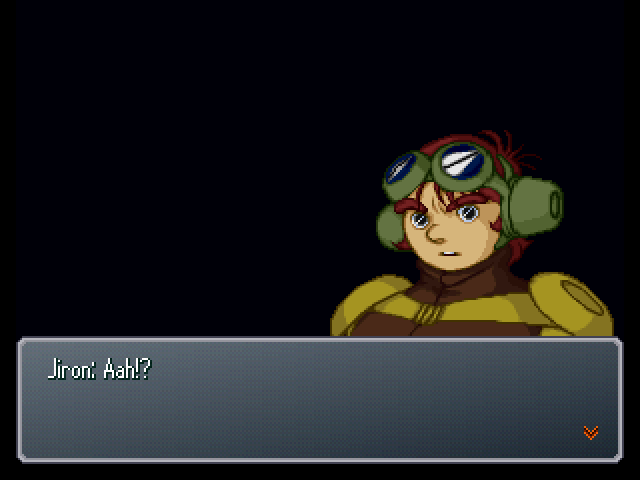 Since we fought against Vickman and won, we get to be the Innocent's chosen soldiers, is that how this works? : If you'd like to think of it that way, yes. : What reason would we have to fight for you guys? : That's a perfectly reasonable question... The Moon Race is a grave threat to those who live upon the Earth. We Innocent have been preparing to fight them, but their technology is far superior to ours. : What happens if we don't take you up on your request...? : (.........) I won't force you to comply. You may continue to work as couriers, if you like. : ...What's the plan, Elche? : (.........) Could you give us a little time to think it over, Sir Biel...? : Very well. I shall provide any information needed in order to make a decision. : That's right. That's Sir Biel's request. : B-but... Isn't it against the Innocent's law to cross the ocean? 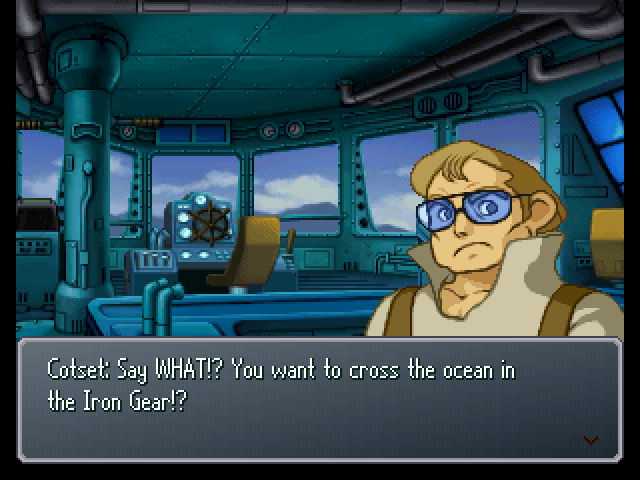 : Hey, what's an ocean? : Let's see... In simple terms, it's a big, infinitely wide pool of water. : A pool of water? Something bigger than an oasis spring? : Yup, you got it. : But, c'mon... Rumors say that there aren't even any blue stones across the ocean. There's no gain in going to a place like that! : Plus it's obvious the Innocent are using us. Only a sucker would take them up on their deal! : It's not like they're ordering us around or anything. : That may be true, but according to Sir Biel, all the major couriers and breakers are already crossing the ocean... And we can get gold and basic necessities any time we want, without paying blue stones! 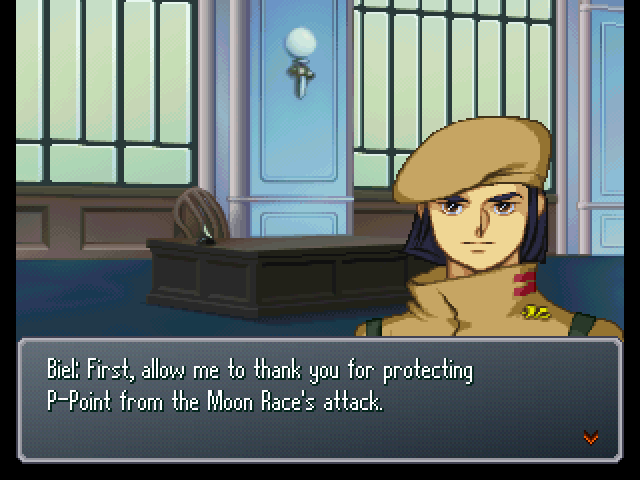 : Still, I've got no idea who these Moon Race guys are, but I don't want to fight with people like that. : ...Jiron, what do you think? : I agree, I think we should accept Biel's request. : I wanna know what the Innocent's angle is in using us. And I'm getting the feeling that the answer to that is somewhere across the ocean. : It's out of character for you to sound so serious. Well, I guess that's okay since you're avenging your folks. 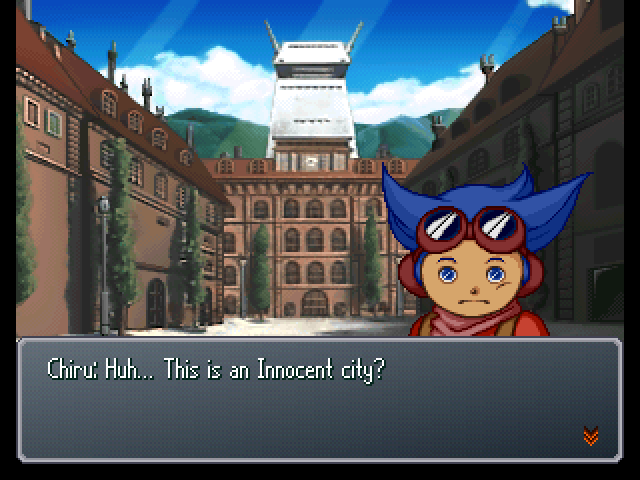 : ...How 'bout you guys, Tetsuya? : Based on what Biel said, our friends should be on the continent across the ocean. So I'd like to search for them if I can. : And if we want to confirm whether or not what Director Biel says is correct, I think we should make some sort of contact with this Moon Race. 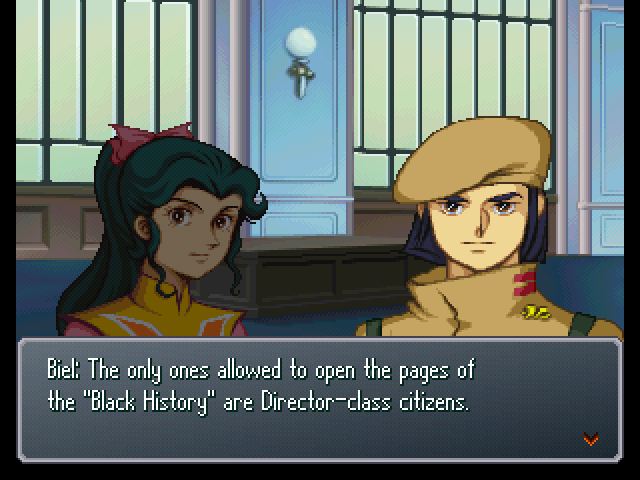 : I wanna know what the deal is with this Black History, too. : If we find that out, we might learn why we came here. : ...Well, looks like it's settled, then. : You sure about this!? : It sounds fun enough, doesn't it? So, Elche, where across the ocean are we headed? 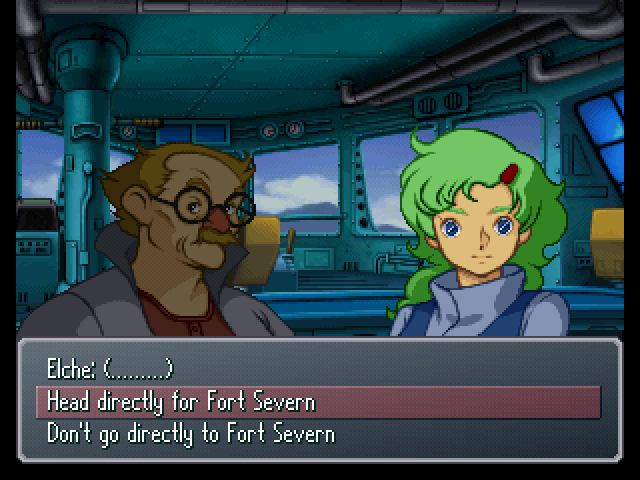 : Sir Biel said for us to head for a town called Fort Severn. : Well then, we can just head there! : Hold on a moment, please. I think it'd be dangerous to trust the Innocent completely. Shouldn't we head to Fort Severn after assessing the situation across the ocean... And learning more about the Moon Race? : The man makes a good point. Decisison time again! Vote now to see which route you would like to see. Like last time, I intend to show off both routes, but this let's you choose which one I do first. UNLESS YOU HAVE PLAYED THE GAME BEFORE, DO NOT READ THIS SPOILER! Do not let the G-bits decide your vote. I intend to make the Severn route the "official" one in this playthrough regardless of the vote.